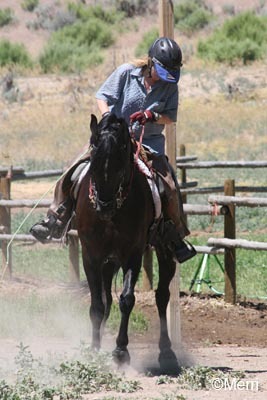 Merri Travels on Endurance.net: Hold Your Head High, Run Fast, Pull Pull Pull! There are two kinds of FAST endurance horses: the one who will slow down to give himself a break either on his own or when you ask him to, and the one who will go fast till he drops. The second type will make it harder on him and you when he resists your requests to slow down. Sound familiar? I expect it's more common than we endurance riders would like to admit. Batman is a talented endurance horse who knows how to go FAST; but he doesn't know when to slow down. The rider has to do that for him... but Batman doesn't really have a good set of brakes. He knows how to pull and he knows how to resist with his head up in the air, back hollowed and mouth braced against the bit. He wants to just go and go and go; but his young body (7 years old) is not yet up to the kind of speed that he wants and knows how to do. Steph took the time on the 50-mile Day 2 of the Cheap Thrills ride to work on slowing him down. She worked on him the whole 50 miles. It was exhausting. We're lucky enough to have a crick neighbor Connie, who is extremely talented at ring work. She can get the hardest mouthed horse to soften, stop resisting, and move forward relaxed, with his head down and back rounded. She's been working with Batman the past couple of days. Day 1 took an hour for him to start getting an inkling of what she was asking. I didn't see Day 1, but the following photos are from Day 2. It took even longer this second day to get him to stop resisting and start dropping his head. It took a while to start getting any response from him, and at first it was for just a stride or two, then his head would go back up in the air. As the session went on, Batman started dropping his head a little longer. "He doesn't get what I'm asking, and his muscles - his neck, his back, and his hind end - aren't developed to work like this," Connie said. "It will take time for them to develop, and then it will get easier for him." You can see in the Head High photos that his neck muscles are well developed on the underside of his neck, from holding it high, and not on the top. Give him a breather once in a while and tell him what a Good Boy he is. We all agree that while Batman is the kindest horse, he's not the smartest. That doesn't mean he can't learn; It just means that getting him moving in the correct rounded way will take more repetition for it to become a habit. But he'll get it eventually. You won't take the 'Go' or the spirit out of your fast horse if you teach him to slow down, drop his head and not pull. 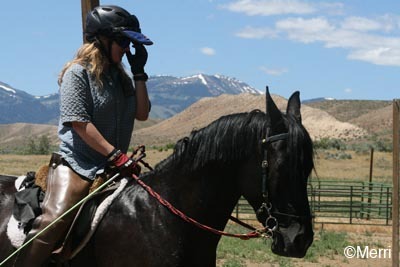 He'll still have the Go, but he'll also have the Whoa, when you need it, or when he needs it... and it will make your rides a whole lot easier and more fun, for you and your horse. Thanks Merri, this is helpfull My 7yr boy that I bred, trained has become this way just this year...last year when we started doing 50's he was push button, easy on the mouth with tons of go but control...no worry where he was in pack....always steady and took breaks as he needed...I never pushed or asked for more than he wanted he just was awesome! So been upset and racking my brain trying to understand why he has become like this and I also thought one thing may be go back to basics and refresh the brain see what happens. Others suggest different bits, or martingales but I feel from expierince this just frustrates them and makes them want to lean and pull harder just like galloping on the track! Good luck with Batman!